Nothing Can Stop This Powerful Walking Excavator! - Muscle Cars Zone! Nothing Can Stop This Powerful Walking Excavator! Having the right machine or tool can get the job done much easier and much faster. This has proven to be right just in any situation possible and that is the main aspect why such machine manufacturers make their product as good as it can get. Offering what the customer needs is crucial in the business. We have all seen the traditional machines used in construction such as dozers, excavators and even forklifts. But there is one machine among all of these that stands out from the rest and is unlike any you have seen so far. We present you the powerful walking excavator. This thing looks absolutely like it came from the future and nothing can stand on its way. It can climb up, go down or move at any direction with ease. In this video we check out this beast in action and it looks amazing. It manages to drive itself from a platform that is couple of meters tall. There is one characteristic that makes this walking excavator so special i.e. its wheels. They can go up, down, left and right according to your needs. This allows for it to slide down a hill, go over a wall or come down from anywhere while maintaining balance. Nothing can stand on its way. It can even tilt to the side if there is no room for the walking excavator to move. Check out the whole video, see how this monster looks in action and tell us what do you think. 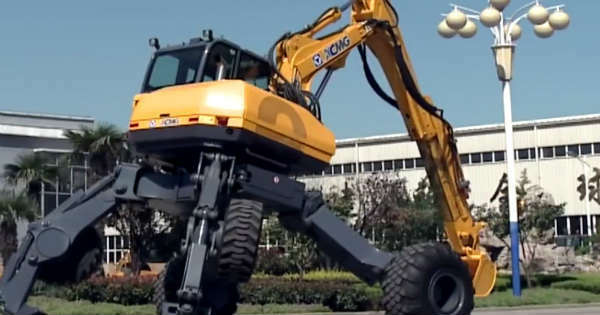 This walking excavator is a huge “Spiderman”.